One of the activities I had signed up for was a talk given by a man named Chip Conley, author of Emotional Equations. Most of the talk dealt with these equations for happiness and love…but he began by telling us about a project he had planned called Fest 300 (www.fest300.com). He had picked the 300 best festivals in the world—religious gatherings, music fest, events of fun—the whirling dervishes, Burning Man, the Color Run 5k, and, of course, Wanderlust. He said that something happened at these big events when humanity was gathered in one place for a common purpose. There was a shared consciousness, an infectious energy. He called it collective effervescence. He spoke those words and my heart lit up. It made a ton of sense…because that’s what I felt like. In my time at Wanderlust, I felt like I was bubbling and spilling over in laughter. I was tingly and 100% infused with positivity. I was indeed effervescent. And so was everyone around me. The goal of Fest 300 was to challenge people to attend one of these festivals every year. Why? Well, it’s easy to get stuck in your own head in your day-to-day life. It’s easy to look around at the mass of people around you and feel completely unconnected. They’re doing stupid things and moving slow and you’ve got places to be. You’ve got stuff going on dangit and they just couldn’t possibly understand that. So you keep moving on in your own track and they continue in theirs and we all pray that there are no collisions. But then there’s these festivals…these productions that involve music or physical activity or prayer or all of the above. And you show up because you want to be there. You show up because you want to be filled up. You show up….and so does everybody around you. So then suddenly, magically, beautifully, there’s a connection. In one foul swoop, you are surrounded by beings who could be quite different from you but you have this one little similarity. So there you are in a drastically more intimate web of humanity. As I write this, I have to laugh because..wow..it’s really sounding like I spent a week at a yoga hippie festival. But think about it. We all want to be happy. We all want to be lifted with joy, right? And we seek it by running a race or dancing to music or offering devotion. And I truly believe that joy is completely contagious. So you are smiling and bubby and the fact that those around you understand this joy because they feel the same way….well, that’s just awesome. Maybe you are still surrounded by strangers, but somehow, they’re not quite as strange. And so this festival becomes its own little world. And in this world, people kinda understand you. And god, at the end of the day, don’t we all just want to be understood? 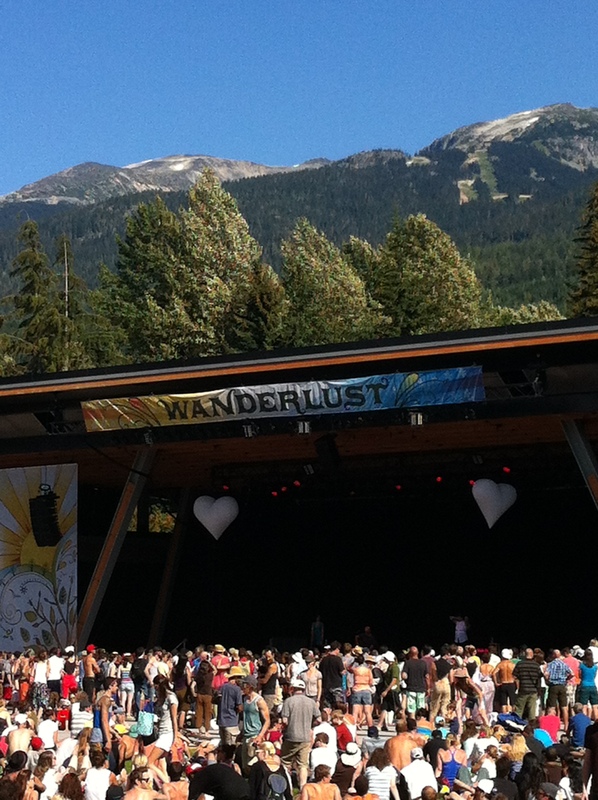 So yeah….collective effervescence is the best way to describe my time at Wanderlust. And I’m not gonna lie—coming down from a trip like that kinda sucked. It broke my heart to leave my friends and I was just getting used to ending yoga filled days with a dip in the hot tub. And then I was in airport for a long time, which I think we can all agree is not the place to find humanity at its best. But my time at Wanderlust completely filled my tank and left me buzzing and I hope that I can carry that into the day-to-day world in which I now inhabit….until my next effervescent event. PS. Make sure to check out http://www.fest300.com and find an event near you….